It seems like I'm always in need of a quick dinner. Sure, I have some frozen meals to dump into the slow cooker but I haven't been able to find anything I REALLY like (although I did find something I REALLY didn't like). Maybe I'm just not a fan of slow cooking? I know, right? The horror! It's like me and roast beef. I tried making it at least 5 different times with different recipes and always failed. Then I actually had some during a buffet dinner somewhere and decided that it's really just well done steak. So not a fan. So maybe I didn't really fail all those times, but it's just that Hubby and I don't like that kind of taste. So maybe it's the same for slow cooking...????? Who knows, but maybe I'll figure it out in a couple of years or at least after a few more attempts at frozen slow cooker meals. Combine tuna, mayonnaise, Greek yogurt, celery, and capers in a small bowl and mix until well blended. Add salt and pepper to taste. Spread some lettuce (optional) in the center of 1 of the tortillas. Spoon one half of the tuna salad on top of the lettuce. Fold the sides over the filling and roll up into a wrap. Repeat for second wrap. 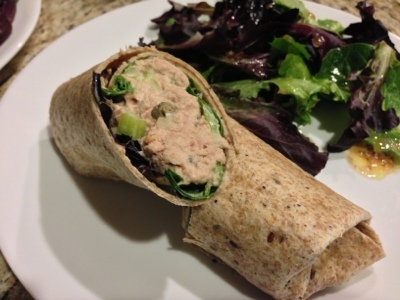 Slice each wrap in half and serve with a side salad and soup. Enjoy!